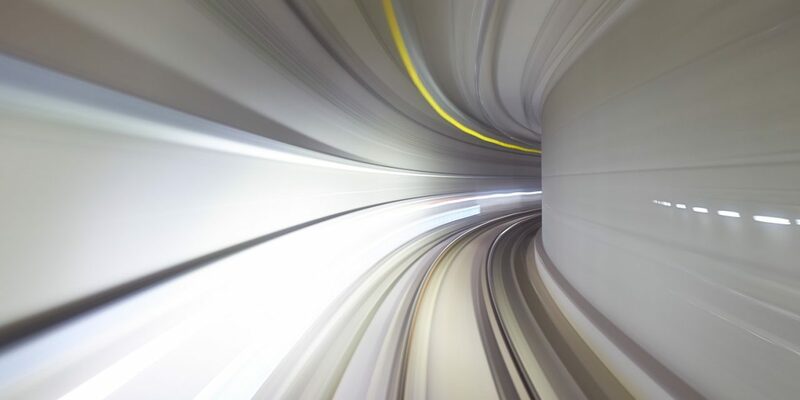 In a stunning feat of engineering – financial engineering that is, not civil engineering – NSW Treasury and its advisers have devised a plan to lengthen the roads on the WestConnex project so they can charge higher tolls. The roads have not been lengthened in a physical sense, only in an imaginative, investment-banker’s sense, although the effect of this financial alchemy is to push distance-tolling prices up by as much as 36 per cent for one car trip. Were it not for actuary and transport expert, Ian Bell, trawling through thousands of pages of turgid documents, the scheme might not have seen the light of day until well after WestConnex was privatised. The state is in negotiations now with three parties to sell 51 per cent of Sydney Motorway Company (SMC); that’s the company which controls WestConnex. It wants the deal done this year. The state election is next year. Higher tolls are an attractive selling point for buyers and increase the sale price of the assets for government. For motorists however, already facing a 4 per cent annual escalation in tolls, more than double the rate of inflation, this is not good news. 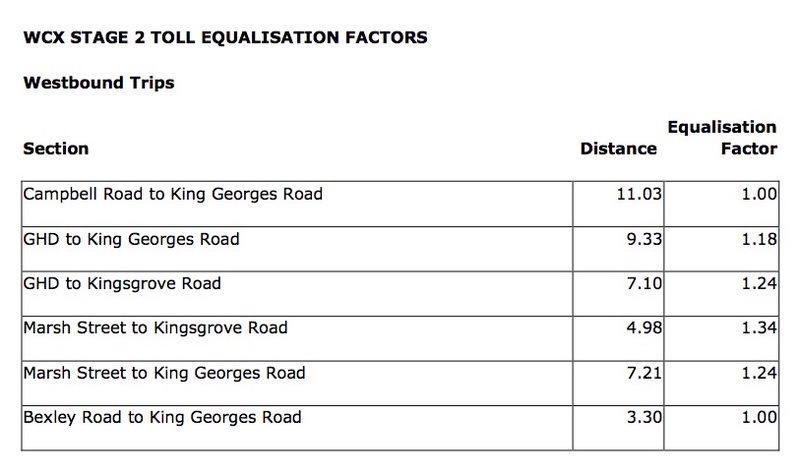 Ian Bell discovered the mysterious term “Equalisation Factor” buried in the schedules to the M5 Concession Deed. “It appears they are, in effect, lengthening the distance of the toll road,” says Bell. “So, you multiply the distance by the “Equalisation Factor” to get the per-distance toll price. You still have to pay a flag-fall but the distance element of the toll … it appears there is an uplift of 18 per cent to 36 per cent”. 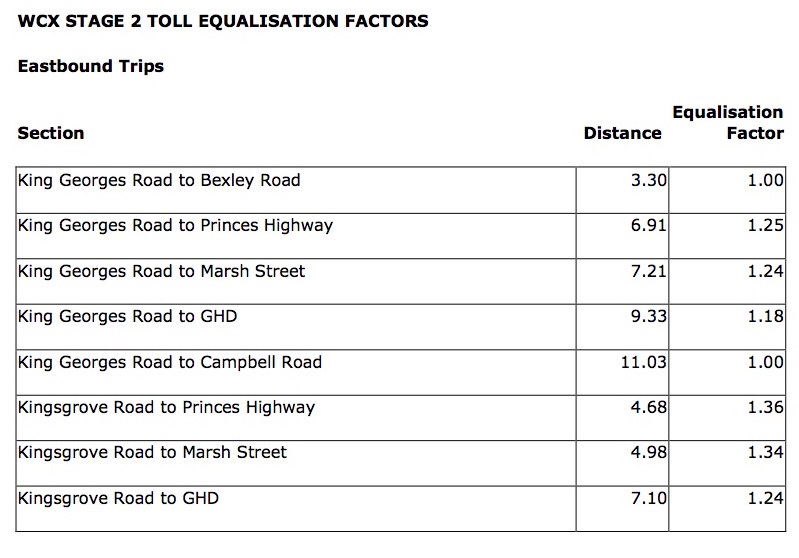 As shown in the following table, the 9.33k trip from King Georges Road to General Homes Drive is subject to an “Equalisation Factor” of 1.18 per cent. 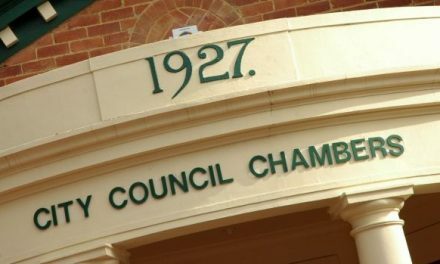 “In the case of Kingsgrove Road to Princes Highway, they are showing an uplift of 36 per cent,” says Bell. “But the “Equalisation Factor” does not align with the distance which suggests that it is not in accordance with distance-based road pricing … or even the state government’s own policy”. 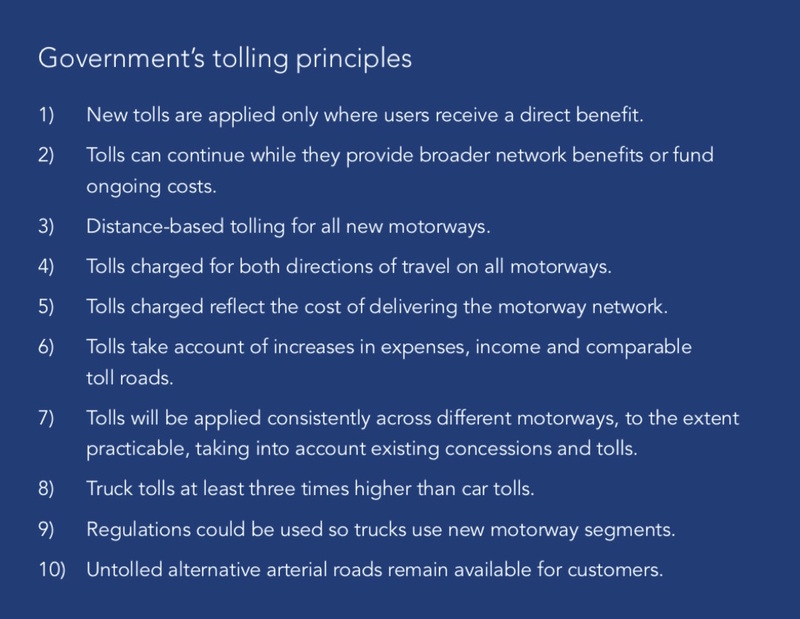 According to state policy on tolling (see Principle #3), there will be “Distance based tolling for all new motorways”. However, the Equalisation Factor ensures this is not the case says Ian Bell. Rather than making things more equal, he said, it appeared the “Equalisation Factor” increased distance tolling and made things less equal – even up to 36 per cent more expensive in distance-tolling terms. The words of George Orwell spring to mind,” says Bell “All animals are equal but some animals are more equal than others”. The Westbound table shows an equally perplexing schedule of fees, which are neither distance-based, nor even mathematically logical. NSW Treasurer Dominic Perrottet was contacted for comment. There was no response. Dennis Cliche, the chief executive of Sydney Motorway Corporation, was also asked for comment but there was no response. 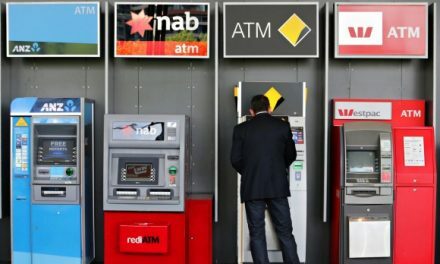 At michaelwest.com.au, we have focused on the financial aspects of WestConnex. The environmental issues loom large as well. For those who would like the latest, visit the blog of Wendy Bacon, investigative journalist and activist.